I want to try this out for myself. My skin is super sensitive but I think this is something that would work for me. :) you write great reviews! Thank you so much for this review, I've been considering switching to a organic skin care range and wasn't sure about Kora. This was very helpful! Chanel tinted moisturiser has been my favourite so far btw. I am on my 3rd month of using kora and my skin has broken out so bad! I dont want to leave the house! At first I thought it was working because the red marks were starting to fade but then pimples started popping up everywhere! So it unfortunaley doesnt agree with me :( If you have normal skin and are lucky enoug not to be prone to breakouts then i would say it would be great for you, it does make the skin shine and they products are lovely. Just BEWARE if you are getting this product to help with your acne. Its worth a try becuase everyones skin is differnet, just didnt work for me, Ive now gone back to oil-free products. Great Post! I ordered the set for normal to dry skin and i love it so far! Hey, just a tip with the tinted moisturiser, firstly - moisturise your face as normal and while its still wet on your face, squirt some tint on your hand with a squirt of normal moisturiser and blend them together before applying. Helps to spread it evenly and stops it from drying out before you do! I use it every day and that tip has helped a lot! Finally! I found it. 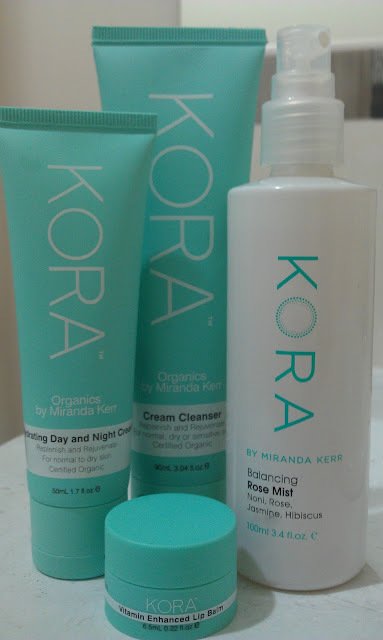 The hydrating mask in Kora range is something I was looking for a year since the line I was using before discontinued their product. The mask that I wanted was for a sensitive/ dry skin, that cools when I apply it, does not dry on my face over time, and washes off beautifully with a little water. It dies not fiam when washing off, and I'm over the moon. I thought I would never find anything even similar to what I was using before (I'm a bit picky) but this mask blows my mind and I'm ready to try other products in Kora range. What's more, the price is qiute reasonable considering it is an organic product. Wow. As the person said a few comments above, be super AWARE that the day/night moisturiser can cause red pimple like spots ALL OVER your face!! The wonderful product I would have to say is the Pure Rosehip oil to use during the night. A lot of the products are very overpriced. My skin did break out with the cleansers and creams a skin specialist advised me its over nourishing the skin with to many essential oils. I was buying the rosehip oil 44.95 for 15ml which is a big rip off Its the name I was paying for. Then at the chemist exactly same product for 50ml 29.95 which is definitely more value for money. Also I must say the worst product out of the whole range would have to be the tinted moisturiser because its too dark and thick and does not apply with even coverage even when I used kora moisturiser with it. Ive saved lots not buying Kora. Very overated the line. Is not value for money and does not last long. I have been using the cream cleanser, cream exfoliator and clay mask for about 2 weeks, and my skin has broken out so bad. I had previously been using pro active (had experienced acne breakouts around a year ago and cleared up quickly with pro active) so I thought it would be a good time to move to natural, organic products. My skin feels softer but I have broken out mainly around my cheeks and chin area. From big tender pimples to heaps of tiny congested ones. Im wondering if its my skin getting rid of all the toxins, but I'm scared to keep going with this product. has this happened to anyone else?? my break outs are also heaps of little bumps! I have never had this before! i have also broken out around the side of my face down to my kneck. i have NEVER had problem skin before! I didn't realise that it was this product until I started doing some research and found out that so many others are having the same problem. I'm so disappointed as I was so excited about this product, however now I am on the way to having acne! My skin has broken out terrible after using Kora for just under a week. So dissapointed but I think I need to stop using it. I have big pimples and little ones on my chin and lower cheeks. Try mixing the Tinted Day Cream with a little bit of the Hydrating Day & Night Cream. You'll find it doesn't "tug" at your skin and you'll get a smooth coverage. management. This is a very popular way of making money, especially if you are just starting out. Selling info products such as digital ebooks from Click - Bank is a good way to solve people's problems and get paid for it.